I sometimes half-jokingly say that future historians will call this century, “The Golden Age of the Labyrinth”. All styles of labyrinths are appearing everywhere, at least in the U.S., at churches of every denomination, retreat centers, schools, parks, homes. If humans suddenly disappeared and alien archeologists landed, they might believe that labyrinths are the core of our spiritual life. Although labyrinths are visually appealing and an attractive addition to any garden or large indoor space, I have felt rather neutral about their use in spiritual practice. Having done many hours of walking meditation – maybe weeks if all totaled – ambulating to deepen spiritual insight is very familiar to me. Walking meditation can be practiced indoors or out, in a back and forth path, around in circles or in a straight line, fast or slow. You can do it anywhere. Its purpose is to collect the heart and mind in the present, to disengage awareness from the mental chatter and connect with a deeper way of knowing and of being. Labyrinths have seemed superfluous to that purpose. Of course, a labyrinth is an ancient form of sacred circle, mandala, and medicine wheel. They hold a special energy. They are symbols of the divine feminine. So, despite my indifference, I figure, you can’t really have too many of them. I thought I might warm up to labyrinths if I used one repeatedly. I didn’t want to miss out on what they might have to offer. Here, at Dechen Ling, was my opportunity. The path of the labyrinth at Dechen Ling is defined by small stones. The design weaves the trail in and out, getting you closer and then farther away from the elusive center, until you finally reach the end of your journey at the heart of the spiral. This is a lovely symbol for the way our spiritual path usually unfolds. We seemingly get closer to our deepest aspirations, to our true nature, and then we lose track, get diverted, distracted and appear to be going in the wrong direction. We forget where we are or become overwhelmed. The labyrinth shows you that, ultimately, every step you take with intention, leads you, eventually, to the completion of your journey. As I walked this labyrinth for the first time in warm mid-day sun, I thought of other places that offered structured walking practice. For example, when I had a massive vegetable garden in Massachusetts, first thing in the morning and when I returned from work, I would saunter up and down the rows, just to witness the life growing there and to see “what was new”. Fresh sprouts, leaves, buds, new flowers or fruits, ripenings or rottings, vegetables stolen or damaged by the local critters who wanted some of the bounty. It was really an exercise in being present, in connecting, in leaving behind the detritus of a burdened mind. So like the garden, a labyrinth is a device, an excuse, an attraction, that invites meditative walking, makes it easy to begin and end, and to do repeatedly. We humans are a forgetful bunch and are easily dissuaded from doing what we know to be most important and true. Anything that reminds us to pause and wake up amidst the bustle and distractions of ordinary life is of enormous help. Each day I slowly paced the inward course of the labyrinth. At the center, the place of completion, I performed the 11-directions ceremony, a ritual based on practices from around the world. Best known are the medicine wheel rituals of Native Americans. This labyrinth was laid out on an east-west axis, making it easy to align with the compass points. I offered a pinch of tobacco (a substance sacred to Native Americans across the continent) to each direction in a gesture of gratitude after I had given thanks to the benefactors of the quality represented by each direction. I asked for guidance and protection. And I clearly set my intentions and dedicated myself to be “a voice for the earth and all life”. You learn that spiritual qualities dwell both within oneself and in the natural landscape. The 11-directions ceremony, like the labyrinth itself, offers a structure to return us to what is essential. After doing this for several days, I appreciated the metaphors imbedded in the labyrinth’s form. It reminds us that we are on a meaningful journey. Many people’s lives are adrift, without purpose, and they miss the potentiality inherent in being human. They miss the opportunity to walk a path of transformation, a path not about transforming into someone better or different, but in transforming into someone who knows who you really are, able to see past the superficiality of ordinary views and delve into deeper truths. The journey of the labyrinth symbolically takes you to the innermost center, the source, the still point. Sometimes the words labyrinth and maze are used interchangeably. However, this type of labyrinth is the opposite of a maze. Mazes are meant to confuse and they foster getting lost. Walking a labyrinth, you are guided, step by step, to where you need to go. The choice is not about which way to go but whether to surrender to a process that is greater than oneself, to follow the mystery to its end. There is an inevitability built into a labyrinth. 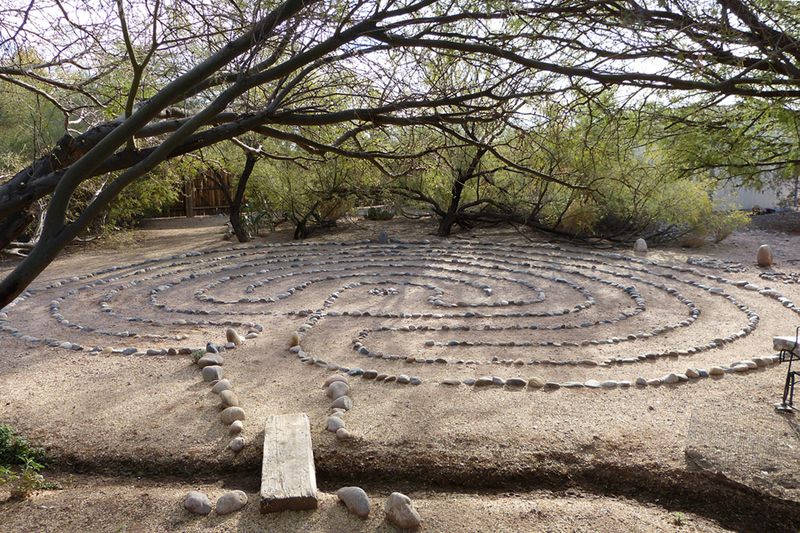 Traditionally, the labyrinth is described as a journey of shedding worldly concerns on the inward course to the sacred center, and then returning outward to the world again, renewed. This was not exactly my experience. The inward track felt like a focusing, an intensifying of intention. The center, a complete stopping, the moment of simple Beingness. The walking outward was the shedding of all separation and becoming more inclusive until nothing is left out. Categories: Reflections, The Big Trip Travelogue | Permalink. Hi Jane, How are you? Thanks for the thumbs up on the labyrinth reflection. It’s a bit more teacherly than other posts so I hesitated to put it on. But I enjoyed trying to grok and then share – to the best of my abilities – my experience of the labyrinth. We’re currently at Mustang Island State Park in Texas. Beautiful weather. I’m watching, as I write this, the full moon rise over the Gulf of Mexico. Ahhh . . . The waters edge is about 20 yards from our camper (which I now call the cabana since we’re living on the beach). I’m still aspiring to get this blog up-to-date . . . but no matter how hard I try I’m a month behind! Carla, I too love your commentary and reflections on the labyrinth. As you know (I think), Robin & I have one in our backyard. Your description of the process accords very much with my own experience. And revisiting the labyrinth regularly deepens the energetic connection. It is astonishingly powerful, even for those of us skeptical of such things. How much better to see life as a labyrinth than a maze! Hi Bob, Yes, I remember your sweet little labyrinth. I am now converted, because, even if a labyrinth is “superfluous” to walking meditation, if I had one, I would do more walking meditation! Another project when I get back to California? I just put up another post which has a few Dzogchen references. Speaking of which, I hope to make the FAC teacher’s weekend in May. I may also be back in Boston briefly in March. Will let you know. Right now, we’re 20 yards from the Gulf Coast at Mustang Island State Park in Texas, watching the full moon rise over the water. From Dharma Bun to Beach Bum.